A growing campaign to stop outsourcing suggests solidarity isn't dead after all. Under the surface, something is happening in the trade union movement. 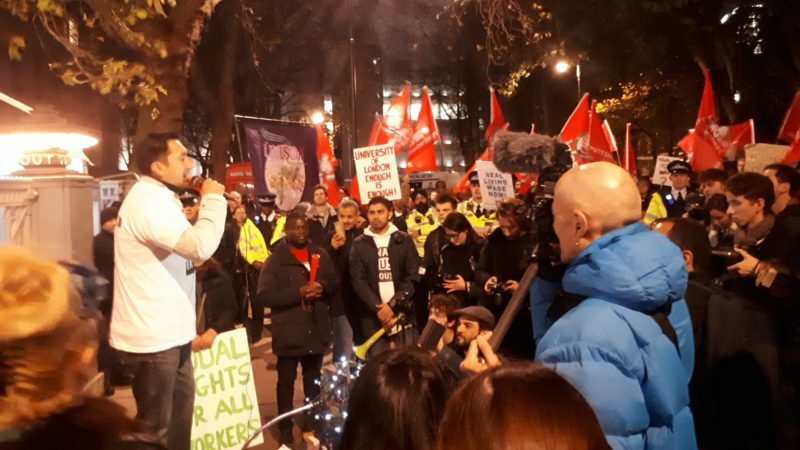 On Tuesday, over a hundred workers working at the University of London – but who are technically employed through facilities management company Cordant Security – went on strike. They chanted, marched and danced outside UoL’s Senate House to demand they are taken back in house. The largely migrant workforce – including many from Latin America – say they receive worse pensions, holiday pay and sick pay entitlements than their in-house colleagues. But unlike most migrant workers, they are members of the Independent Workers of Great Britain, a small insurgent union that is starting to organise those previously thought ‘unorganisable’ by many larger unions. They are being supported not just by students, but by those in workplaces that at first glance seem very different: art-house cinema staff, McDonald’s workers and Uber drivers. What brings them together is the precarity that often disproportionately hits migrant workers and young people across the gig and service economies. Yaseen Aslam is a member of the IWGB’s drivers’ branch, who took Uber to court last October over drivers’ employment status – and won. ““We talk about exploitation in developing countries but it’s here [too]. “This [outsourcing] should be happening. We’ve got the same issues, and we’re still not getting our rights. Indeed, on the same day, the union filed a landmark case to extend trade union rights of outsourced workers. If they win, they will be allowed to bargain and negotiate with the de facto employer: in this case the University of London. “We have message: we deserve better. “It’s not just the cleaners here. It’s workers across the country, in every strike that’s going on at the moment. “These workers are coming together to say we want stability in our lives. “These workers are the front-line of the trade union movement. When the big unions have given up on them, they are expressing their militancy. “And when these workers win this dispute, it means all workers can win. It was a common message. All the speakers finished with this line: “Hasta la victoria siempre.” Ever onwards to victory. With this kind of solidarity – something many thought was long gone – they might well be heading that way.